It is two years to the day today since reader Pam Anderson had a great question after trying — and failing — to find a truly archaic legal term in her pocket copy of Black’s Law Dictionary. And since the question came up again yesterday in another setting, all The Legal Genealogist can do is say: oh boy, do I still have an answer to that! Because there really is a version difference here — and you don’t want to buy the wrong book. In other words, when you find that very lovely and relatively inexpensive version of Black’s Law Dictionary, and it’s the fifth edition or later, don’t buy that book! If you absolutely positively have to have a physical book version of a dictionary, the Fourth Edition is the last one to try to find — and it won’t come cheap. Amazon has some copies in its marketplace from third party sellers; the cheapest version this morning is $59.98. There was one on eBay where the auction won’t close for another five days, and bidding was already at $49 — or you could buy a second one for a flat $59.98. I personally recommend that genealogists buy and use the first version, published in 1891. It’s the one written closest to the time that the records we usually work with were created, so the language will be closest to what the record-creator meant. Again, if you just have to have a physical copy, you can have your very own copy of a reprint in hardback from Amazon. It’s only $195 new — or if you want a copy of the original, you can buy one used for $374.37. Also appears to be available for mobile now! A Latin-English dictionary is often helpful along with Black. Black’s Dictionary is very nice for the later 19th century. For earlier research I needed Bouvier’s Law Dictionary and Blackstone’s Commentaries On English Law. The John Adams Library is available on Internet Archive. It has a wonderful collection of early law books and language dictionaries you would expect of a 18th century lawyer and diplomat to have. I encountered a will in 1840 Republic of Texas that was filled with Latin phrases. It seems odd a will from that late a period would use so much Latin, so maybe I am missing something with that one. The court clerk had a great deal of grief in his attempts to record the correct spelling of all that Latin. A more comprehensive source is Georgetown University’s Law Library and its wonderful Digital Dictionaries: 1481-1916 collection. See “More dictionaries,” posted 25 Mar 2015. 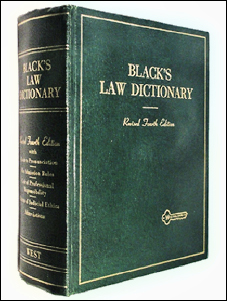 Black’s Law Dictionary 1 is available free on-line at http://blacks.worldfreemansociety.org/1/ I have the CD for 1 & 2 but this is faster. I use this frequently.